...except the fight that matters, the Event EX. There is no team that destroys everything. A varied roster is required to complete the hardest content in this game. Garnet, Beatrix, Cait Sith is not unique in being able to destroy anything that isn't the hardest content. I can complete literally everything that isn't hard content with Setzer, Yuri, Garnet AOE shenanigans. The current EX required me to use Rem. The EX before that, Eiko, and Vanille. I think it's great that strategies require variety, I just wish that variety was a little more expanded. Right. In a perfect world, I would have all characters, some type of equipment for all, and at least 50 crystal level for all, and would try to use the synergy characters as much as I can. Since I just started in November'ish time frame, I'm still catching up. As for the playerbase.... it seems solid for me. I read somewhere it’s above 15-20 k but I don’t remember where. I mean BE is still miles more popular as it’s been around 4 years but this game is getting played a lot still. I’m guessing many don’t care about artifacts and didn’t vote or they just skipped all the notifications entirely. Yeah, I kinda skimmed through the voting notification and didn't bother to figure out how/where to vote. Not too mad or surprised by the results. Gives me a chance to get perfect artifacts for Terra and some long term investments like WOL. I almost stayed up at 4AM (new event time for GMT +2) I thought we would get Palom LC today but nothing, well I’m glad I went to sleep then, haha. I’m still not used to this slower release of content. I want to kick in and be like "ya, it's slow Kourio"... cause that's how i feel but, really if i were talking to myself I would then say to self "so go fricking do some crystal key quests!" since i'm not where you guys are. Upcoming events has a timer that counts down to start time. Yes, I already know about it thanks. It's just that there was a time where GL was supposed to catch up to JP and we had new events every Monday and Thursday, I just gotta adapt to the slower pace. Catch up to Japan? Not at the pace we're going. I can't wait until I can change my already amazing Terra passives for BiS ones. 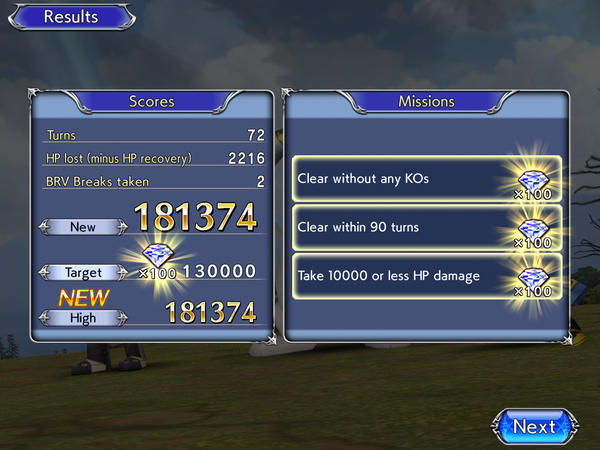 Finally got over 190K in Agrias' EX. And no I’m not going to redo it for the 500 gems, it already took me so much hours just to clear this. Congrats. I've got a Faris at 60/54, I may give that one fight another try, between Faris and Garnet enWater. Then if doesn't go well. I will finally break down and watch some vids/read some turn order etc, to "get gud"
Madvin_a, WarAdept - I've even considered making a vid of a fight and asking you guys (if/when you have time) to point out every single thing I did wrong, overlapped, left out, didn't consider, etc. I want to take my level of play to the levels of my accomplishments in FFRK, yet I don't want to spend hours (over years) reading and trial and error to get there lol. But anyway, this was meant to be a congrats post to you Kourio, but I quickly made it all about me. I just saw your screen and it made me think how I want all those rewards! So far I've only beaten the one EX so far that I think was Beatrix event, not sure. Thanks, nothing impressive but it’s better than completely skipping it, thankfully it’s last of the super hard trilogy of EX fight if we trust Reddit. Used about 20 tickets on Agrias banner and got a dupe 15 cp Ashe.... meh. 100k gems saved up though so still going strong. Hopefully I can grab her stuff with the remaining tickets I can get but I wont be too bothered if not. Anyway, looking forward to Palom. I think in JP they started to give one free 15cp for LCs starting with Palom's so hoping they add that change in global now too. Second attempt. I probably would have gotten higher if I didn't take my time on stages before boss to save abilities. Party was MLB Agrias x2, Cait Sith and Layle with Bahamut summon. I have nothing for Faris so I had to rely on RNG paralyzing. Now to do Palom LC. Quistis LC is so close and Rinoa is probably in June. My gem stash needs to be ready. Is "dps meta" as simple as Kuja puts out big booms like Terra or (physically Vaan), and just get stack up your biggest "boomers" and burn it down? 1. Cait Sith still very viable correct? 2. Is the game (that you know of, since you follow it much closer than I do) going to start moving to "Element" teams that we have seen yet? I ask the second question because that's where FFRK went, and I'm trying to figure out if I should go through my characters and sort who is what element. I paid no attention to elements in this game until you fine folks brought my attention to this game having Imperil and Infusion (Garnet for both) and pairing with Beatrix. I had not read the moves close enough before that, and just lucked out that I had her EX. I'm sure that sounds really lazy, but i try to juggle several mobile games, and still be a normal person in real life too lol. Therefore I make a list for just about everything. I have a hard time carrying Palom this time, and so far I didn't reach the 500 gems score. "DPS meta" is pretty much characters you deal so much damage you hardly need other to support, you'll see a lot of strats telling to use Kuja friend with EX + Bahamut for last wave and he'll destroy thoses, at least until Golbez and then Rinoa. Dunno about Cait, he seems to lose his effectiveness for me. Not that I'm aware of, the it's more based on characters than teams, recent example in the Japanese version is Sherlotta doing damage equivalent of her teamate bravery (without depleting it) in addition to her own. Opera Omnia hasn't ever really focused on elements or even turned it into a meta. The current focus in Global is Launch meta but that eventually turns into high burst damage and teams that give as many turns as possible to do insane damage since the bosses HP becomes ridiculous. That is why next big group is Lenna, Quistis and Kuja. Rinoa and Golbez after and more recently in JP Golbez and then Ultimecia. I don't think OO will ever become element team focused like RK did especially with the amount of useable characters in battle and movesets being smaller. 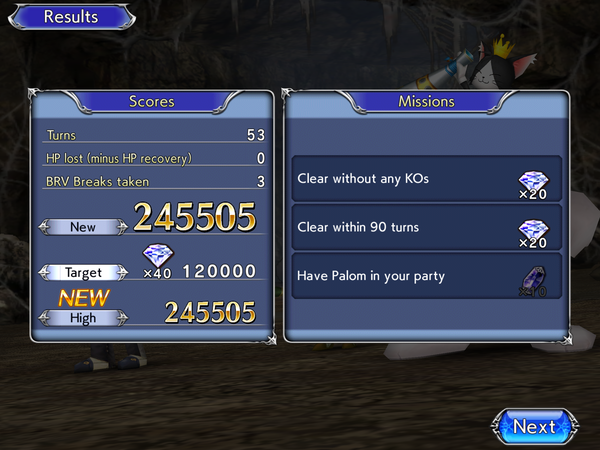 Now to find a way to carry Palom, he’s already 56/60 I guess I’ll level him a bit more. I had no patience so I just popped 100 gems to carry Palom so that I could do a proper second run and get all rewards. If you still want to try without gems or Palom MLB then grab all his armour and crystal awaken him to the max so that he can at least contribute a little. Also equip any MLB weapon. Kouriozan Wazzy - Thanks for the insight you two. Hopefully I get something good with Kuja and/or Rinoa. Might use 100 gems as well, but I'll wait tomorrow so he's 60/60. I wish we would get the 15CP with the lost chapter already. Interesting interview with OO's producer. Looks like weapon skins are an option they are working towards. Also more global first characters could be in our future if there's enough interest. Excellent interview! If the game came to console i'd be so ecstatic. Weapon skins and more global firsts is great to know. Personally, I'm wondering which characters they have in mind. We have Yuna and Paine but not Rikku which is weird. I'm sure she's next in their plans. Apparently, normal LC clear will also give 500 gems and it happened between Palom and Kuja LC, same time as free 15CP for them. So we would get 12500 gems if you completed all of them. I'm always here for more gems, especially with the big banners coming up. Quick maintenance just before the awakening wave, I see they try their best to prevent datamining. Not even a quick video about the new passives like before. I have waited too long for their awakening. Also surprise me with a Seifer EX thanks. Can't wait to farm for Terra! Also, here's a video of how the FF mobile games did in 2018. I think it's only the US? Opera Omnia got 3rd place behind BE and that shite FFXV empire game. The Revenue does seem a bit low but at least it's still kicking and then again the game is still young. Apparently they are planning a character from one of the Final Fantasy games that is considered more niche. Everyone take guesses as to what game it is. JF: There isn’t much of a difference in terms of how people play. It seems that the motivation toplay for everyone is to strengthen and develop the characters that they like. By the way, characters such as Cloud and Squall are popular no matter the region. The ads for that XV game are hilarious lol. Sure makes crazy money though! And it's nice to see OO about on par with RK. That game's been out for several years now so that could bode well for OO's longevity to see that it's performing similarly. Hmmm there is supposed to be a mysterious EX on one of the banners right? I'm really hoping it's one of the awakened characters. Emperor's kit looks pretty fun. Skip for me as well, Quistis is coming too soon to waste precious ressources on those banners. Might try 20 tickets or so on Kuja before though. Looks like the EX could be super hard, they’re already tanky for the coop, at least there is a kickass music for wave 1. Free draws only got me 2 power stone. Only two weapons I didn't have spread over both banners and managed to get at least one of them. Not bad. Lotsa content/grinding to do now. I'm gonna gather tickets first for Lightning's ex and if I don't get it I'll use gems. My free draws were pretty great. Mlb'd Squall's 15 cp, and 2 other weapons were power stones (Lightning 15 and cloud 15 already mlb) 2nd draw was a gold orb that gave me Ace 15 cp, Terra 15cp x 2, and Layle 15 cp x 1. 4 15 cps on both draws lol. But anyway. About to get on soon but will probably pass on both EX banners. Only interested in Sazh and Lili for this awakening and I have their weapons maxed.